Sometimes the best meals happen on the spur of the moment. I came home today with no plans for dinner, but with a lovely loaf of ciabatta bread. I was inspired to buy this bread after seeing Ina Garten make garlic bread with ciabatta on her Barefoot Contessa program not too long ago. When I told my dad that I wanted to make garlic bread, he suggested spaghetti marinara. Sounded good to me! Dad went out to buy some marinara mix, and I started working on dinner. Spread the mixture on one of the slices. Spread butter on the other side. Reassemble the loaf, cover in foil, and bake in a moderate oven for 5 minutes. Remove the foil and bake for a further 5 minutes to crisp it up. Slice into chunky fingers. 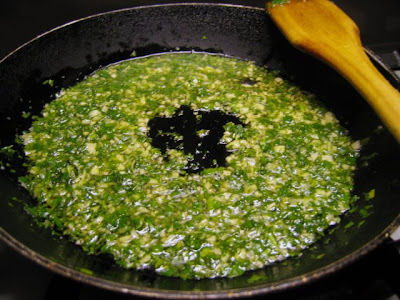 Then it was simply a case of tossing the cooked pasta with the sauce, and scattering some chopped parsley over. Ta-dah! Dinner was done. Easy and delicious! It only took about 30 minutes all up. Even without a recipe, the pasta turned out really well (and I almost never cook without a recipe). Lucky. 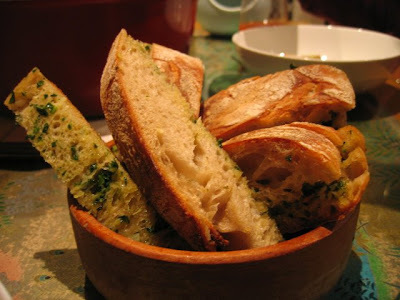 I loved Ina's garlic bread, and highly recommend it as a tasty accompaniment that's a little bit different from the usual. What happened to your Japan post Sarah. It popped up on my RSS feed but when I clicked to comment, it was missing. I'm really thinking of going to Japan later this year. How long did you end up going for? I remember reading somewhere that you posted a lot of stuff back to Australia? How much did you end up sending and did it cost a lot? Pasta and bread are the best combination ever created! 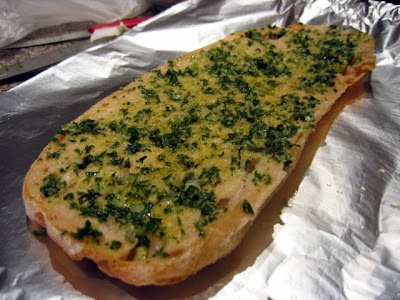 I love Ina's recipe for garlic bread and it is super easy. Have you ever used a bit of ricotta in your marinara? It makes it heavenly! I LOVE Ina Garten :) although her cookbooks are way expensive here. That garlic bread looks so good. 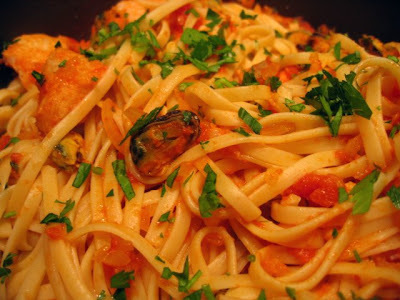 What sort of seafood was in the marinara mix? Malaysian - Chinese - Australian food lover. Lives in Melbourne. Loves eating, cooking and baking, in this great city and around the world. Married to Sandra. Addicted to biscuits. My email address is sarahcooks [at] hotmail [dot] com.